Randstad Sourceright announces global leadership team appointments. Home » Randstad Sourceright Insights » Randstad Sourceright announces global leadership team appointments. ATLANTA – June 19, 2017 – Global talent solutions provider Randstad Sourceright today announced a series of senior leadership appointments that will accelerate the company’s growth in Asia Pacific and Europe. In APAC, Anthea Collier has been named managing director, APAC and joins Randstad Sourceright’s global executive leadership team. Collier is a leading global talent acquisition expert with more than 20 years’ experience in the industry, across APAC and the U.S. She joins Randstad Sourceright from Allegis Global Solutions where she was Managing Director for Global Account Management across recruitment process outsourcing (RPO), managed services programs (MSP) and integrated talent solutions. With the APAC region one of the most important markets for global customer expansion, particularly for clients in the U.S. and Europe, this appointment reflects the company’s accelerated growth ambitions throughout the region. In EMEA, Sue Ruddock has been named managing director, UK and Ireland. Ruddock has more than 25 years’ experience as an international recruiting expert. With roles spanning global account management and operational leadership, Ruddock has played a key role in delivering RPO and MSP services and leading talent acquisition teams for major blue-chip companies. With the growing maturity of the U.K. market, Ruddock will lead the team to help customers redefine their talent models through the integration of all talent types and enabled by cutting-edge technology. Louise Rafferty has been named director, UK and EMEA Regional Sales. With 13 years’ experience in talent outsourcing, Rafferty comes from a leading global HR outsourcing company, where she managed contingent talent for more than 100 industry-leading companies. With her extensive sales and leadership experience within RPO and MSP, Rafferty will play a key role in bringing integrated talent consultancy to the U.K. market, and supporting our customers’ ongoing growth across the EMEA region. Niall Anderson has been named chief operating officer of Randstad Sourceright EMEA. Anderson has extensive experience in outsourced recruitment solutions, talent acquisition and risk management. He previously led global resourcing efforts for a number of international companies, including Barclays. 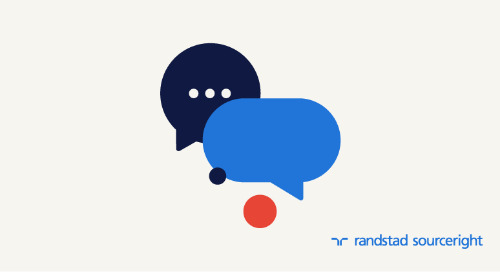 To support the evolving needs of Randstad Sourceright’s customers, Anderson is leading the company’s shared services strategy across all EMEA-based recruitment centers to leverage the latest developments in processes, technology and operating models. Their appointments follow the hiring of Zain Wadee, who in October of 2016 was named managing director, EMEA, where he oversees all aspects of business strategy, market development and talent acquisition within the region. Wadee has served in a number of leadership positions during his 20-year tenure in the staffing industry, including managing director for Pontoon Solutions. During the first quarter of 2017, Randstad Sourceright experienced double-digit topline growth globally. This comes after Randstad Sourceright launched its Global Talent Innovation Center, which tripled the company’s investment in talent analytics and technology platforms. winning the war for millennial talent. 2017 Strategic Talent Acquisition Conference: how to overcome challenges in talent acquisition.